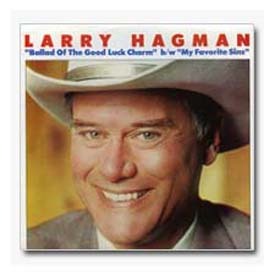 Thank you for visiting the Larry Hagman Legacy Library gift shop. We are pleased to offer these exclusive and collectible items, all benefitting our library. Each noted signed item was autographed by Larry before he passed away with no personalization. Each order comes with one of Larry's $10,000 dollar bills. For orders totaling over $250.00, we will include an auto-penned signed $10,000 dollar bill. All Hello Darlin' book orders will include a blank, non-autographed, specialized Hello Darlin' by Larry Hagman bookplate. Check back for our monthly specials. Please allow at least three to four weeks for delivery. And remember our library supporters enjoy a special 15% discount off of all gift shop items - won't you consider joining us today? If you have any questions about our gift shop, please email giftshop@larryhagmanlegacylibrary.org. A true collector's item! This 45 record was recorded in 1980 by Larry and released by Lorimar. It features the single "Ballad Of The Good Luck Charm" with the b/w "My Favorite Sins". All 45 records have never been played. Color sleeve the same on both sides. Each 45 record sells for $20.00. Order your Ballad of the Good Luck Charm 45 record using the below PayPal button. Library members: Please use the below PayPal button to enjoy your 15% discount.